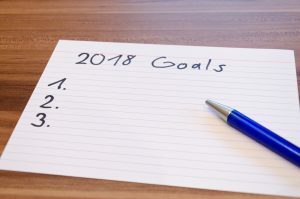 It’s 2018: Have you made your New Year’s resolutions yet? Up-to-Speed reached out to court reporting students to ask them about their resolutions and goals for the upcoming year. Many of us resolve to start exercising, travel more often, or pick up a new hobby. But these students are all work and (mostly) no play. “Making resolutions is usually not my thing,” said Rosalind Dennis of Arlington Career Institute in Arlington, Texas, “but I am this year!” Ask Connie Hwang of Plaza College in Forest Hills, N.Y., what her resolutions are and she gets right to the point: “Finish my stenography degree. Start working as a court reporter.” She is not alone. It seems every student has one thing top of mind this January: working hard. What does working hard look like? “In 2018 I would like to become proficient in steno writing. I would like to eliminate hesitation and become more confident in muscle memory,” said Vickie Pelletier, of the College of Court Reporting in Valparaiso, Ind. Pelletier, like many students, is focused on her skills. January is a natural time to look back over the past year, assess your progress, and set some goals for the next 12 months. Macy Thompson, another student at the College of Court Reporting, will be one of those aiming for her goal. “I want to keep expanding my knowledge in briefs and phrases to help with less hesitation. My list of improvements could go on forever. I just really want to improve my speed,” Thompson said. The ultimate goal of a student, as Hwang noted, is not to be a student any longer. Dennis said of her resolutions: “I plan to be vigilant in my practice time, finish school, and test in September.” When asked to narrow down just one goal for 2018, she picked, “Reaching 225!” More than half of the students who responded to Up-to-Speed indicated that graduating and finding work as a court reporter were their goals as well.